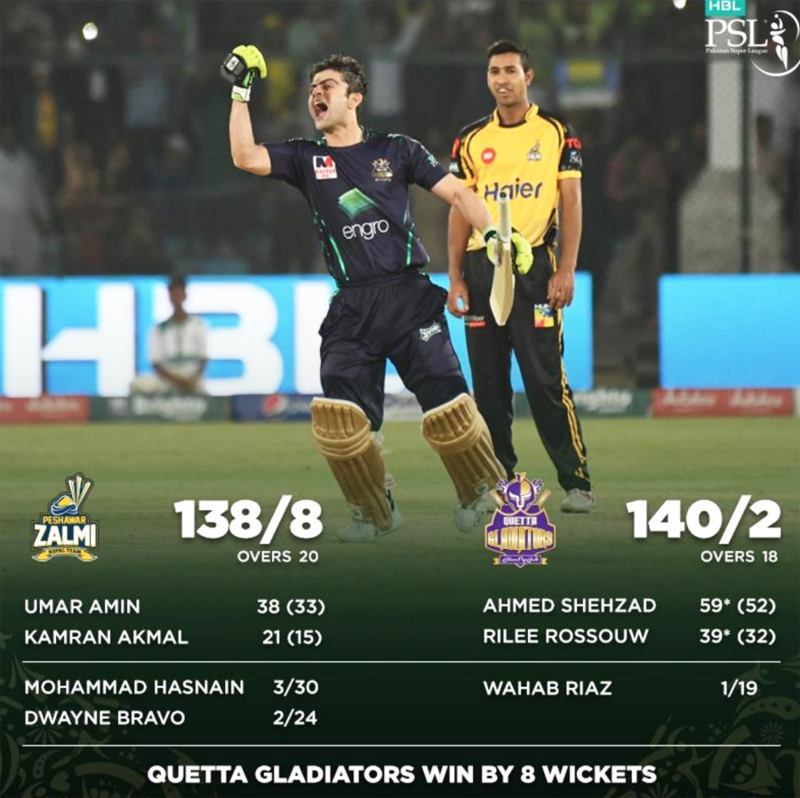 ISLAMABAD: Quetta Gladiators beat Peshawar Zalmi with eight wickets to spare in the Pakistan Super League (PSL) final on Sunday, the fourth and largest edition of the national cricket league tournament that has been called the biggest sporting event in Pakistan’s history. The Quetta team has reached the final match of PSL three time before but won for the first time. Peshawar Zalmi set a 138-run target for Quetta Gladiators to chase, which it beat, at the final of the match being played at the Karachi National Cricket Stadium on Sunday. The first 26 matches of the tournament were played in the United Arab Emirates and the last eight in Pakistan’s seaside financial hub of Karachi. Some 40 foreign players, led by former Australian all-rounder Shane Watson, current New Zealand opener Colin Munro and West Indian stars Dwayne Bravo, Darren Sammy and Kieron Pollard, were part of the series. The final was dominated by security concerns as 13,000 policemen, including hundreds of senior officers, took to the field to ensure a peaceful game. Over 2,500 paramilitary Rangers guards and hundreds of soldiers from the Frontier Constabulary were also on duty as part of security arrangements for the final game. The South Asian nation has been largely starved of international cricket since a 2009 attack on Sri Lankan cricketers in Lahore killed eight Pakistanis and wounded six players and a British coach. The incident forced Pakistan to play home matches in the United Arab Emirates and led foreign players to refuse to play on Pakistani soil. But the unprecedented popularity of Pakistan Super League, which has brought 40 foreign players to the country this year, is seen not just as pivotal in changing the global cricket community’s opinion of Pakistan’s ability to host international matches but also become a symbol of a brash, emerging nation trying to end years of isolation due to security threats and terrorist attacks. Pakistan Cricket Board officials said before the first season of the league in 2016, over a hundred international players approach by the board to play on Pakistani soil refused, citing security concerns. This year’s edition comprises over 40 foreign players including former Australian all-rounder Shane Watson and current New Zealand opener Colin Munro.